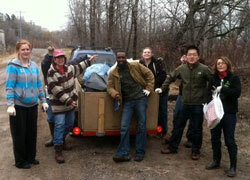 Members of the Duluth Superior Eco Rotary Club clean up debris along the St. Louis River. We will be spending Earth Day, 22 April, as we have the past several, with members of the Duluth Superior Eco Rotary Club cleaning up debris along our “adopted” river, the St. Louis, which separates Duluth, Minnesota, from Superior, Wisconsin. It is a magnificent river, flowing 192-miles long and draining 3,634 square miles, the largest U.S. tributary to Lake Superior. Our mutual love of the river and her environs draws us together as a Rotary club, and has helped our club remain youthful and energetic. Members of both communities on either side of the river are united in common purpose through our hands-on service projects and our focus on the environment. Every year, there is a lot to clean up from the public areas along the river. The lower river forms the Duluth-Superior harbor and has been home to many industries over the last century. In 1971, the Western Lake Superior Sanitary District was formed to address severe pollution caused by cities and industries dumping their waste directly into the river. But today, we find that much of the pollution is not industrial, but the results of people dumping trash or not cleaning up after picnicking or boating. We bring two to three overflowing pickup trucks full of trash, discarded furniture, tires and more to the sanitary district, which disposes of the garbage for free, as a community service. As our four-and-a-half-year-old club matures, we have partnered with like-minded organizations and spread the word about our efforts in the community. This year, we are partnering with the St. Louis River Alliance, which works to protect, restore, and enhance the St. Louis River. In this way, we are continuing to build on our mission of enriching our community through active, environmentally responsible local leadership and global service. Earth Day is an opportunity for all of us to demonstrate our commitment to clean, healthy, sustainable communities. As Rotarians, we can lead the way by bringing together our diverse viewpoints to creatively tackle challenges in each of our communities. The first Earth Day channeled the energy of its time to put the environment front and center. This Earth Day can serve to re-energize and re-focus our efforts in working for a clean and healthy planet, which in turn contributes to a peaceful world. For Earth Day 22 April, learn more about the Environmental Fellowship of Rotarians. Read a story about the Duluth Superior Eco club. Read about Dubai Rotarians fighting the scourge of pollution. This entry was posted in Empowering youth, Growing local economies and tagged Earth Day, environment by Rotary International. Bookmark the permalink. Thank you all for leading the role. Keep it up, water is life.